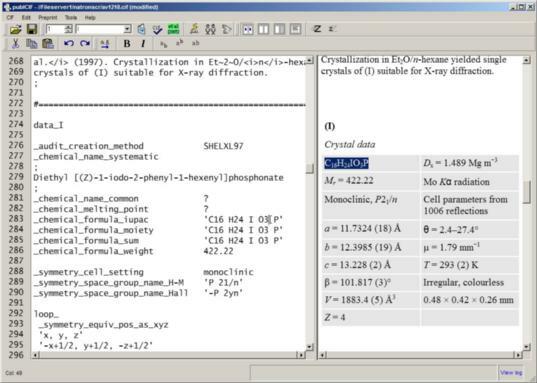 publCIF takes a crystallographic information file (CIF) and prepares a formatted paper (Preprint) in the style of Acta Crystallographica Sections C and E, and IUCrData. publCIF employs extensive CIF syntax and dictionary compliance checking, both as you type and when specifically requested. In addition, it provides a number of editorial tools to help you write your paper in the style required by IUCr journals. IUCr Journals now include a Funding information section in journal articles and additionally include this information in the distributed metadata associated with articles (see http://journals.iucr.org/services/funding.html). 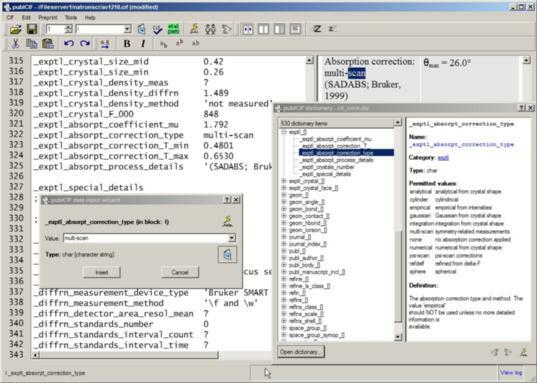 This version of publCIF includes a widget to collect such data for CIF-based articles. To download a free copy of publCIF, please fill out your email address and click on the download button below. We will use the email address to notify you of new releases of the program.